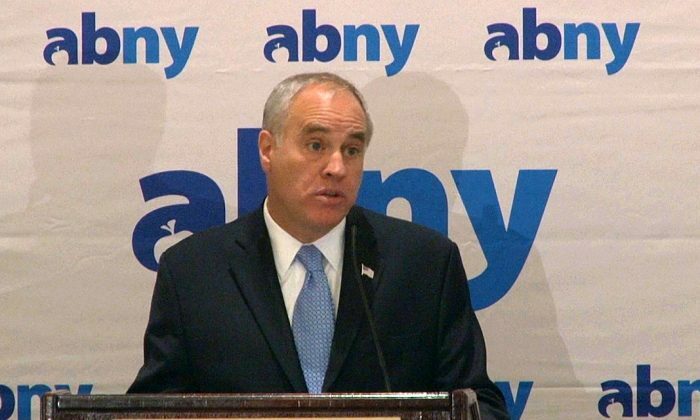 NEW YORK—New York State and New York City’s economies have been improving since the 2008 financial crisis, said New York State Comptroller Thomas DiNapoli on Wednesday. The state is about on par with the national average, which was 6.6 percent in January, according to the Bureau of Labor statistics. At 7.8 percent, New York City’s unemployment is a bit higher but also going down. This trend is good for workers, but also good for the government. If more New Yorkers have jobs, the government will save on social services like unemployment benefits, and receive more in income tax. It is also good for business as people who have jobs usually have more disposable income. While the unemployment figures look good, they do not tell the whole story. He says the majority of the jobs created are in the retail, entertainment, and home healthcare sectors, not the high-paying Wall Street jobs that account for 16 percent of all state tax revenue. According to a report issued by former Mayor Michael Bloomberg in October, 2013, the tech-information boom was responsible for roughly one-third of private sector job creation in New York City. It is still second to the financial industry in terms of money spent on wages but has grown 11 percent since 2007. Job growth in the securities industry has declined by 12.6 percent. DiNapoli said he hopes the tech industry can make up some of that decline. “We’re going to have a report coming out looking at the impact of the startup business in that area,” promised DiNapoli.